Fall webworms feed on at least 88 different species of plants. Its favourite host plants include Black Walnut, Wild Cherry, Hickory, Crabapple and Birch. 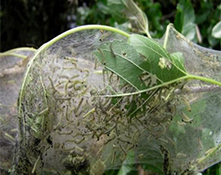 Fall webworms create silken tents over the foliage toward the outer portions of the tree. Adult moths emerge in the late spring or early summer and are mostly white. In June or July, the females lay globular white or yellow eggs in large masses beneath leaves. These eggs hatch in about 10 days. Larvae pass through as many as 11 instars on their way to developing into adults constantly enlarging their tents to include more leaves and shoots to feed on. Fall webworm overwinter in cocoons attached to the trunk or in organic debris on the ground. Look for developing larvae as goldenrods begin to bloom. 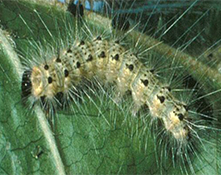 As they occur so late in the growing season there is usually no need to control webworm. Unsightly webs can be pruned out or dislodged with a strong stream of water. 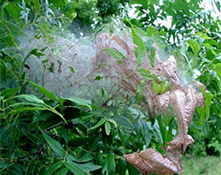 These caterpillars stay in the web while feeding, so pruning the webs at any time of day will eliminate them. If treatment is required, treat nests and surrounding foliage with Bacillus thuringiensis (BT). Webworms have many natural enemies including birds, predaceous bugs and parasitic wasps. Leaving the webs intact allows populations of their natural enemies to develop.